This template is all set up for you just to add your own words. 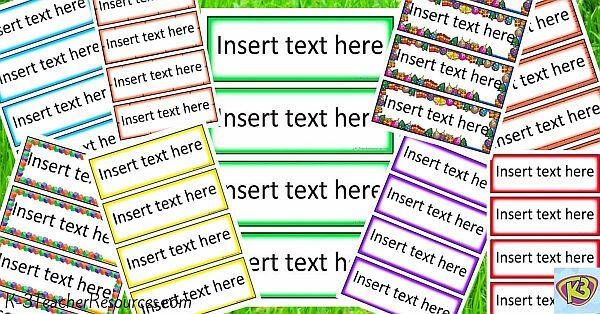 Just delete the words we have placed in there and replace them with your own words.Highlight or make the phonics sounds within the words a different colour. Terrific as practice for spelling words – set this up so children can type and print out their own spelling lists. Also ask them to highlight the phonic sounds for recognition practice..
Make them into spelling word booklets similar to our theme word booklets. We need some smaller name labels ,the current ones are all too big. Hi there, I can’t remove “insert text here” to type in names! Hi Jeanette – OK, that’s odd – can I ask which border it is thanks Jeanette – sometimes it comes up with an ‘enable editing’ notice at the top – does this happen for you? I’m looking for a list of words that relate to hospitals for use in our “Hospital” home corner. Hi Jenni – this is a great idea – I have added this to our list – hopefully by the end of next term – sorry it couldn’t be sooner – just working on Fairy Tales Words next.